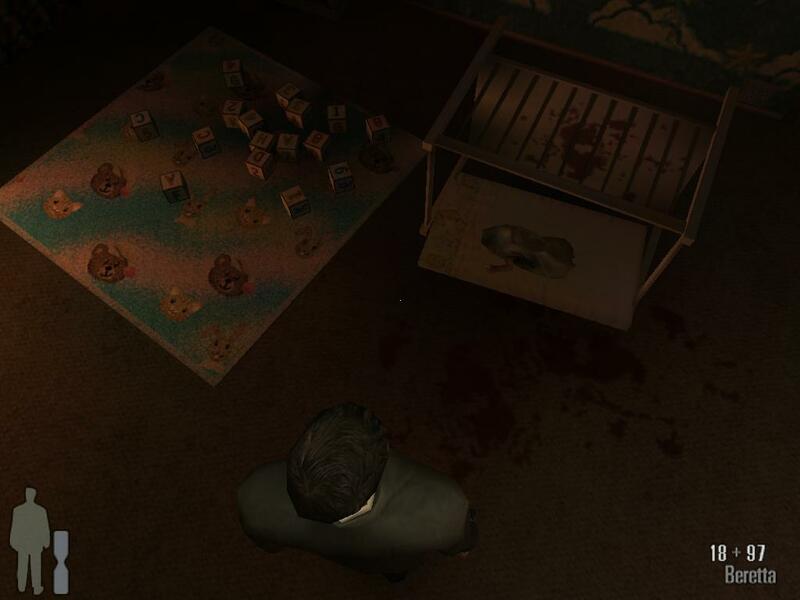 I was going to put a picture up that highlighted the cool graphics of the game, but instead I put this one up with the following comment: WHAT THEY HELL WERE THE GAME DESIGNERS THINKING IT'S A DEAD BABY!!!!!!!! You're a loose cannon, Payne! People have always loved outlaw cops. From Dirty Harry to Kindergarten Cop, movies about rogue cops with nothing to lose have always been appealing. We don't really care that they violate the criminals civil rights; all they need is a gun (or two guns, which is even better) and a plausible excuse as to why they are kicking as. However, there are few video games that tap into this bad cop genre. Fortunately for all of humanity, Max Payne fills this void with lots of gun shooting, pipe swinging, pill popping wholesome family fun. Max is understandably pissed about the whole thing, and goes off in search of the people who developed the drug that the junkies were on when they killed his family. The rest of the story unfolds in a series of dark and metaphor laden graphic panels that end up looking like something Stan Lee might draw if he was horribly nearsighted and also high on LSD and crack. The text in these panels tries to draw you into the plot, but ends up sounding like the dialogue you might read in a second rate detective novel. The sun went down with practiced bravado. Twilight crawled across the sky, laden with foreboding. Oh get off your high horse Max! Somebody get this guy some therapy. The game takes itself way too seriously, and then doesn't even deliver the plot to back it up. The game is full of plot holes and unresolved loose ends, and often detours off in strange directions, from a military bunker to a gothic dance club. I presume 3d Realms eventually plans on making a sequel, but they could have at least made the ending somewhat satisfactory. However, the writing in Max Payne still rates far beyond that found in a typical shoot em up, and they do get credit for at least attempting to introduce a coherent storyline. What they lack in plot they do make up for in length. Max Payne goes through a bunch of locales before the game is through, so you will definitely get your moneys worth out of the game in both body count and hours spent completing the game. There are also more modes of the game you can play once you beat the game the first time, but they are just playing the same game at a harder setting. It's not the Matrix, I swear! Fortunately, the graphics in Max Payne easily cover any gaps in the story, and still are some of the best Ive seen. The game fully utilizes the Bullettime effect found in the Matrix, and even models the individual bullets. This means you can leap forward, guns blazing, and see every bullet that comes out of your gun (or is heading towards you) in superb detail. In fact, there is one level in Max Payne that look suspiciously like the scene in the Matrix where they enter the military base (it even has columns to duck around like in the movie). Bullettime is more than just a pretty special effect in Max Payne. Since you can aim in real time while in the mode, you can target your enemies to deliver hyper accurate fire. All of this comes at a heavy CPU cost though. Those who have older machines (or new crappy ones) should stay away from Max Payne, or be forced to play it with the graphics turned way down. Why, at that lower graphics level you might not even notice the detail that went into the dead wifes body, and you would be a worse person for it. Basically, Max Payne is a great game for those of you out there who enjoy bloody shooters or mediocre detective stories. GamingHyena gives Max Payne 7/10.